The long awaited follow up to A Thousand Sons by Graham McNeill is finally here with The Crimson King! Bridging the gap between Prospero and how the Thousand Sons end up on Terra, this book takes us on a mystical and exciting journey through the Warp as Ahriman attempts to reunite the fragmented shards of his father's soul. When A Thousand Sons first came out I was blown away by it. It was, and still is, one of my favorite Horus Heresy novels. It took the Thousand Sons legion and established them as one of the true tragic victims of the Heresy, forced into their situation by poor decision making by Magnus and the machinations by Horus. When last we left them they were broken by the Space Wolves and left licking their wounds on the Planet of the Sorcerers, their new home within the warp. Since then they have popped up in a few short stories or as side characters in other novels, but we never found out what happened to Magnus and his sons after they were forced to flee the Imperial retribution. What took them from loyal victims to finally siding with Horus and marching upon Terra with the rest of the traitor legions? 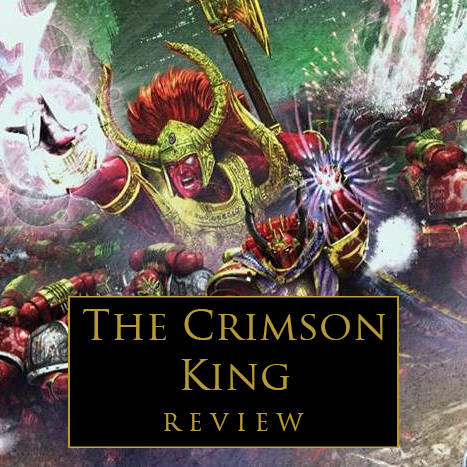 When the story opens we find Ahriman and a small group of Thousand Sons, as well as Lucius of the Emperor's Children, onboard a strange alien vessel seeking out a prophet. It felt like something straight out of the start of the Heresy series when there were still weird, unexplored areas of the galaxy for the story to go to. Since the Heresy has unfolded more we have found most of our attention on Marines vs Marines in somewhat familiar settings, but here we got to explore the strangeness of the galaxy again. It doesn't really have an analog to the 40k universe either, which always makes it better. I was a little thrown off on why Lucius was with them since it wasn't really explained. I imagine there is a short story somewhere that I missed that throws his lot in with the Thousands Sons, but he was a welcome addition anyway. After securing the prophet they came for, a demon bound within a sarcophagus, they retreat back to their new home. On the Planet of the Sorcerers Magnus is beginning to fray, his soul having been shattered at the same time as his back was broken by Russ. Now but a mere shadow of his full might, he wavers between cognizant, and unaware, attempting to retain and catalog all the knowledge that was lost on Prospero. There was a nice moment where he converses with a psychic projection of Lorgar. Magnus and Lorgar were some of my favorite moments from Aaron Dembski-Bowden's Word Bearers novels and it was nice to have their relationship recognized in this. Amon, one of Magnus closest confidants besides Ahriman, has been taking care of his liege in the Head Librarian's absence and acts as a self appointed gatekeeper to their Primarch. Once all of them are reunited it is decided that Magnus must abandon his quest to recover all of the knowledge lost, which was splitting himself even more, and instead find the missing shards of his souls to be made whole again. After a ritual that see the Thousands Sons reliving the horrors of Prospero which results in Amon's back being broken just like Magnus', the locations of the missing shards are revealed to them, in a way at least. Tasked with recovering these lost shards, Ahriman sets out to find all of them, the first one located on a psychic prison guarded by the Sisters of Silence. Without giving away too much of the plot, the story follows three main arcs, Ahriman's, Amon's, and Promus', an ex-Ultramarine librarian now working for Malcador. Ahriman has gathered together a group of powerful legionaries including Hathor Maat and, as a nice surprise, Ignix. If you've read John French's Ahriman series then Ignix will be very familiar to you. Besides just being a great character who's wholly unique for the Thousand Sons, he comes across more as an Iron Warrior, it also helps connect the universe more. By making him an important character in one series then having him show up in another, also as an important character, helps reinforce the believability as a living, breathing person. Hathor Maat also has a really interesting story arc in here that involves Lucius, and the demon prophet from before, now bound in a machine body by Magnus, acts as the devil in their ears, but also their guide on their quest. Amon's story is the oddest, pretty much chucking all concepts of time and reality out the window since it mostly takes place within the Warp. There's a lot of mind bending stuff going on, which is perfectly fitting for the Thousand Sons, and Magnus in particular. There's a lot of stuff in here the felt allegorical, but being the Warp, was very literal. Everything definitely had a very mystical vibe to it, and Amon comes across as the "old wizard" character type, but with some nice twists. While his story was very interesting, I would say it probably had the least direct impact on the finale of the book, except for in one part. Having said that, I don't think it should have been cut, since it gives us our most direct time with the main shard of Magnus' soul. In a sad kind of way, Magnus is almost portrayed as suffering from Alzheimers Disease with Amon sticking by his side trying to remind him of who he is and what's going on. It really is quite tragic and sad. Promus has been tasked by Malcador with hunting down Magnus and stopping Ahriman from completing his task. He's not on his own though, and has a pack of Space Wolves led by a Rune Priest and Nagasena to keep him company. Nagasena is another creation of Graham McNeil from The Outcast Dead book, and a pretty good character too. Again, it's nice to see this type of connective tissue throughout the books. This is a real interesting lot of characters, especially once they start confronting Ahriman. The Space Wolves all live up to their reputation, including their continued mixed viewpoint on psychic powers, hating them in general, but utilizing them themselves. The big set piece at the Sisters of Silence prison where they first run into their prey is pretty exceptionally awesome. That's just the mid-point of the novel too, with much more to follow it. There are a few other surprise characters from A Thousand Sons who show up during the story, which are a welcome addition, and play a very integral part too. There's a really cool scene with Ahriman and his group venturing into the warp, that's just as mind bending as you would expect. The finale is perfect for this story and sets the legion up nicely for the next part in their story. It also has several call backs to past important events in the Thousand Sons history and wraps up everyone's storyline nicely. I really hope we get to see McNeill handle the Thousand Sons at Terra, since these are really his babies and he deserves to write their final outing. I really enjoyed this book, both as a follow up to A Thousand Sons and as a stand alone story. It continues on a lot of the story threads from that first story nicely and also ties into a lot of what we have read from future books like John French's series as well as the Master of Prospero primarch book from McNeill. The story itself is relatively fast paced, with even the "slower" scene capturing your attention due to everything that's going on in them. Like most Tzeentch books, you will want to make sure you're paying attention while you read so you don't miss anything. Ahriman is riveting as always, and Magnus continues to be one of the most tragic figures from the Heresy. I would definitely recommend you read A Thousand Sons before this, otherwise a lot of it will be lost on you, besides that one book, there aren't any others that are "required" reading. Having said that, reading The Outcast Dead would definitely add a bit more to your experience. If you're a fan of Magnus' scions then I definitely recommend you read this. As far as the main Heresy storyline goes, it does an important job of informing how the Thousand Sons ended up on Horus' side and at Terra, so I would recommend it for people who just want the core story as well. Now, on to Terra!